South African batsmen Aiden Markram, Hashim Amla and Quinton de Kock were among those making strides up the rankings charts following their star acts in their team's 3-0 series win against Pakistan. "The wickets we play on are very tough on the batters," Ottis Gibson, the coach, had said after the final Test in Johannesburg, which the home side won by 107 runs on Monday, 15 January. He went on to praise the application shown by the South African batsmen against a quality pace attack – and their hard work was reflected in their gains in the rankings as well. Amla, who rediscovered form, returned to the top 10 on the MRF Tyres ICC Test Rankings for batsmen in the latest update, rising by three after his two fifties in the series. Markram improved on his gains from earlier in the tour to finish the series at No.8, helped by his 90 in the first innings of the third Test. ICYMI. South Africa have moved up to second in the @MRFWorldwide ICC Test Team Rankings following a 3-0 series sweep of Pakistan! De Kock rose by a considerable 12 positions to No.14 following the century that earned him the Player of the Match award. And with Dean Elgar at No.11, it made it four South African batsmen in the top 15. Against a four-pronged South African pace attack, an inexperienced Pakistani batting line-up too could find some solace. Babar Azam, one of the highlights of the series for the visitors, rose five places to No.20 with career-high points, while young Imam-ul-Haq climbed 23 to No.73, also a career best. The experienced Azhar Ali, however, lost six places to slip to No.25. 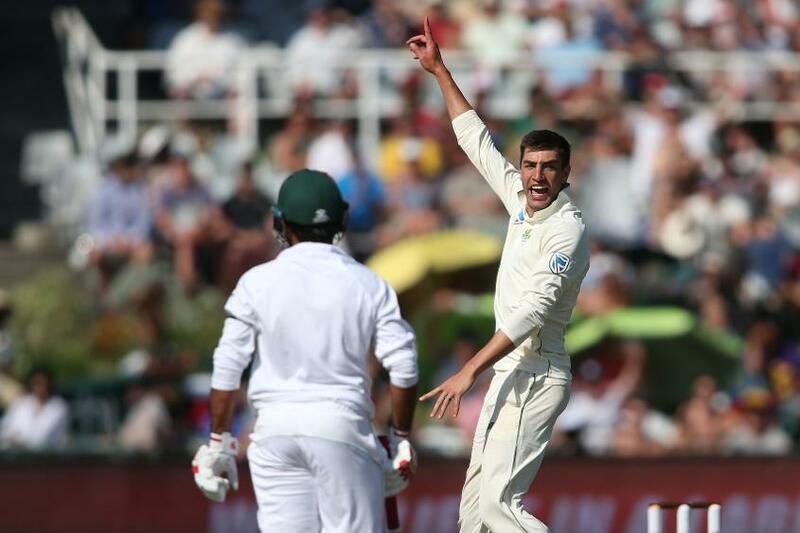 After a series dominated by bowlers, Duanne Olivier, who topped the wickets charts with 24 for the series, including figures of 5/51 and 3/75 in the final Test, had another reason to celebrate, apart from his Player of the Series award. He climbed eight spots to No.24 on the MRF Tyres ICC Test Rankings for bowlers, joining his teammates Kagiso Rabada (No.1), Vernon Philander (No.3) and Keshav Maharaj (No.23) in the top 25. Dale Steyn, however, slipped three spots to No.27, despite his two vital top-order wickets in Pakistan's final innings. "We are very fortunate to have that arsenal of four fast bowlers." South Africa stand-in captain @deanelgar reflects on the victory in Johannesburg that gave them a 3-0 Test series sweep. The opposition bowlers too had reason to be proud of their performances. In fact, the lower order starred with the bat as well, swinging their bat where the top order struggled. Shadab Khan, who made 47 in Pakistan's second innings, to go with his four wickets in the match, broke into the top 100 for batsmen (No.97), jumped by 23 places among bowlers (No.78), and capped it off by climbing 20 spots to No.53 on the MRF Tyres ICC Test Rankings for all-rounders. Faheem Ashraf, who played only the last Test, pushed forward his case with six wickets, which took him to No.58 among bowlers, up a massive 48, and No.57 among all-rounders with another 25-place leap.